Making that summer pesto reminded me that I've had some sun dried tomatoes sitting in the fridge that have been whispering "psssst pessssto" to me every time I spied them hiding in the back. 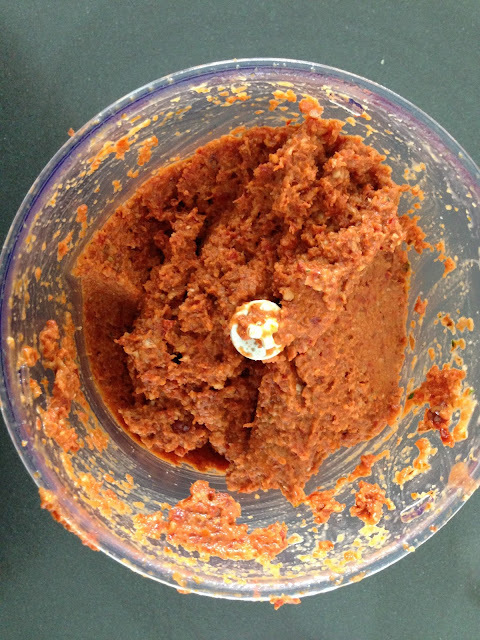 Having the food processor out and being in a pesto-making mood, I figured the sun dried tomatoes' time had come! For inspiration I looked at some of the usual suspects. Smitten Kitchen had a yummy looking Walnut Pesto, but that was more focused on walnuts than on the tomatoes. 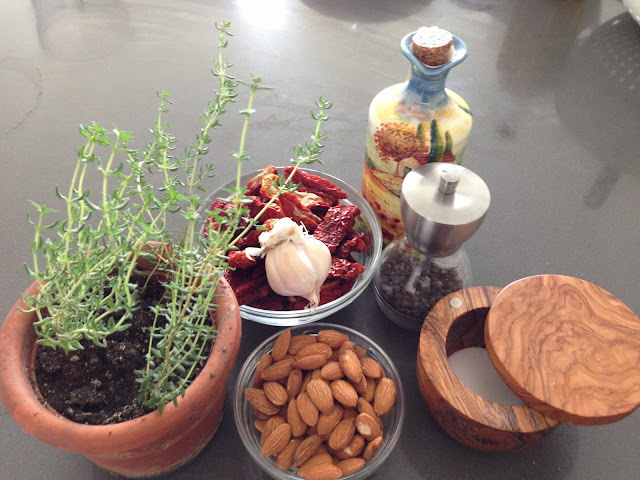 Ditto TheKitchn's Walnut Pesto with Sun Dried Tomatoes. A Bon Appetit recipe on Epicurious seemed a good bet, except that I'd used up all my basil with the summer pesto. Though none of these were exactly what I had in mind (or in my fridge), they gave me enough to go on to whip up a simple sun dried tomato pesto of my own! Look at our little thyme - isn't she delightful? This is the first time I used any of the herbs from our mini widow sill herb garden! Toast the almonds in a pan on medium-low heat for a few minutes to release the nutty fragrance (be careful, they burn easily!). 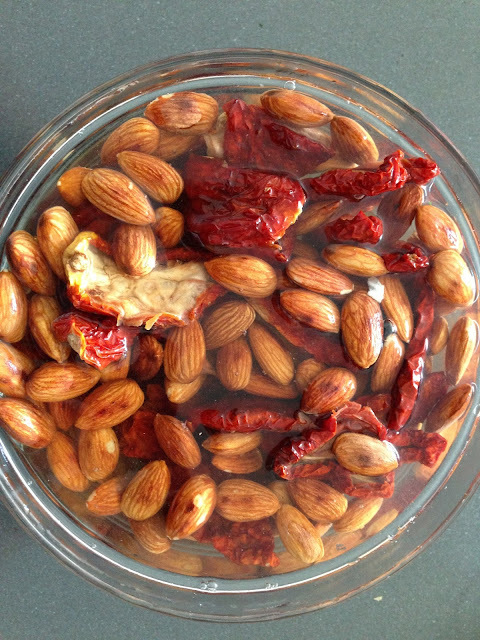 Cool, then soak them along with the sun dried tomatoes in some water for about 10 minutes. Drain (reserve the water - use some of this to make the pesto more pesto-ish) and pulse them together in the food processor with the olive oil, garlic paste, salt, pepper, and thyme. Add up to a cup of the reserved water (adjust according to the consistency you want). And done! I'm popping some of it into the freezer for a lazy night, but keeping some in the fridge to scoop up with some crackers or spread on some toasted bread for crostini. Always good to keep a yummy snack on hand for those late afternoon hunger pangs! You'll see that this pesto is a lot firmer than the summer pesto - this is why! This way it can be a spread and you can always make it more saucy by adding water or cream when you heat it up to eat with pasta. In fact, it would probably be a good idea to add a little cream (or milk to be lighter) when you heat it up because it has quite a strong tomatoey flavor that might do well if made a little creamier.